Displuvium is an artistic research that examines the human desire to control our natural environment, particularly meteorological phenomena. Since the late 1940s, several entities – governmental and otherwise – have chemically intervened on clouds to influence rainfall. This controversial practice known as “cloud seeding” can prevent hail from ruining crops, relieve periods of severe drought, intensify showers over strategic areas in the context of military conflicts and even prevent rain from falling on the proverbial parade. Displuvium’s shape and materials are linked to the role of fountains and water basins throughout history. In Ancient Rome for instance, wealthy households enclosed an atrium: a semi-covered central room, typically surrounded by porticoes. An opening in the roof lit the house and allowed rainwater to flow into a basin known as the displuvium. For the servants who worked in these houses, the displuvium was a window on an outside world that they were not free to explore. Additionally, occupants could apprise themselves of the weather by monitoring the water surface for raindrops. The displuvium was thus an everyday source of distraction and information, not unlike the digital screens of today. In addition, the Latin prefix dis-evokes separation, an anomaly or a malfunction. A reference to rigged meteorological phenomena. 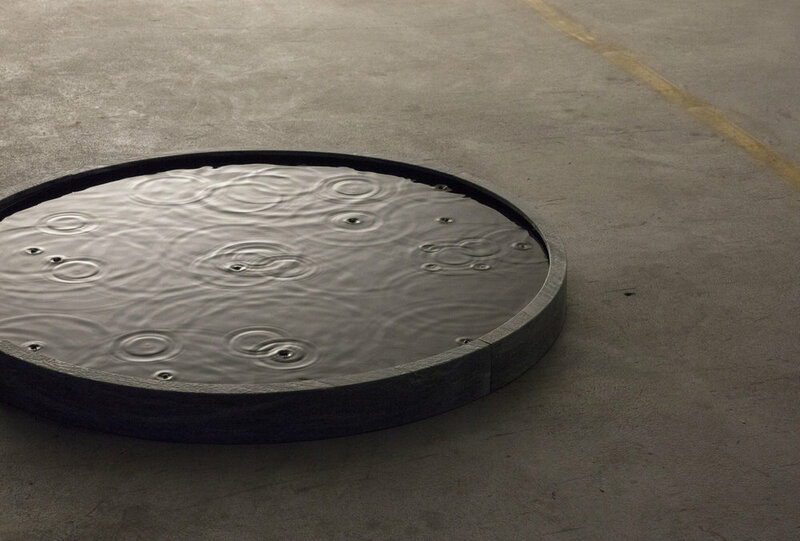 The installation, developed with Fragmentin, takes the form of a pool filled with water and placed directly on the ground. On the water surface, the visitor can observe rainfall: water drops are generated by tiny underwater nozzles. Two screens attached to a nearby wall display a map of historical events related to rainfall episodes; sometimes of natural origin, sometimes tampered by humans. These non-linear sequences of variable length, provide the narrative framework of this installation. When controlled meteorological events are represented, drops are organised into recognisable patterns. The artificial hence replaces the natural and randomness is suppressed through control. This « programmed rain » is unsettling, but also possesses an intangible, uncanny beauty. Is the visitor able to perceive the gradual transformation of the rain’s rhythms? When does seemingly natural rainfall reveal itself as a controlled and artificially created downpour? Displuvium aims to demonstrate the link between humans and nature. It illustrates the ease with which it is now possible to reproduce natural phenomena, thanks to technological breakthroughs. However, this installation also reveals the limits of our control over the environment: the failures which dot the sequence remind us that some things are patently beyond our control.